Aside from that we had Pattaya’ s top VIP’s, Media Partners, General Managers, Hospitality groups and influencers join us at this prestigious event in Pattaya. As Dash worked on his master pieces, he infused a traditional Thai influence, while maintaining his own signature styles in the paintings. 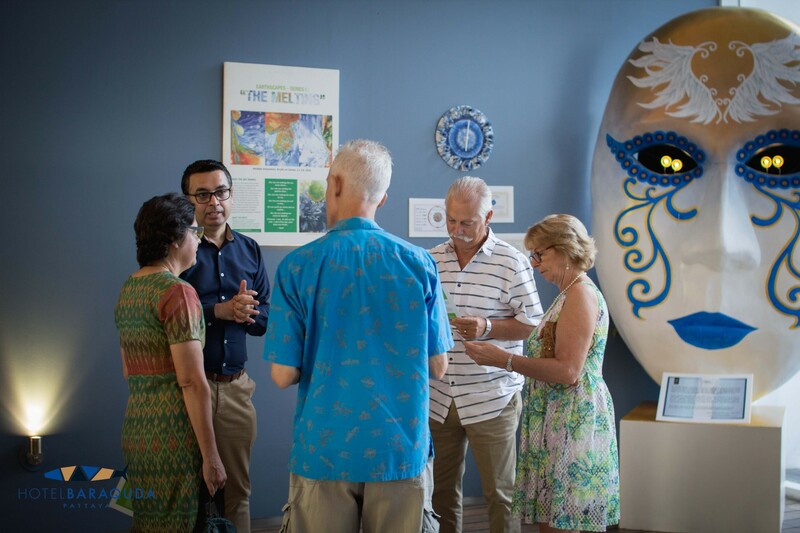 We also got volunteers from our VIP’s and media partners to collaborate on paintings with him as they ventured into the realms of abstract oceanic art infused with traditional Thai influence. 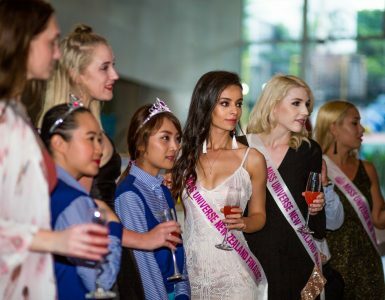 Some of them include Sophon Cable TV, the Ministry of Cultural Affairs, members of Pattaya City Hall, Fabulous 103 FM Group, Retox Group, Choice Group Asia and our very own selected Le Club guests in house! At the end of the event, all the paintings were auctioned to the audience in house with the proceeds going to our partner charity organization – Hand to Hand Foundation Pattaya. We also used this event to raise some issues on the Ocean pollution problems facing South East Asia, especially Thailand. Recently, a large whale was found dead ashore of Thailand with plastic waste inside its stomach. Being a green art crusader, Dash wanted to raise these problems via his paintings, the collaborators paintings and a small session in between talking about what we can do as people to help combat this problem. The artwork was based around this theme, while we encouraged our guests to use some powerful hashtags we provided if they intended on posting some pictures or videos of the night. 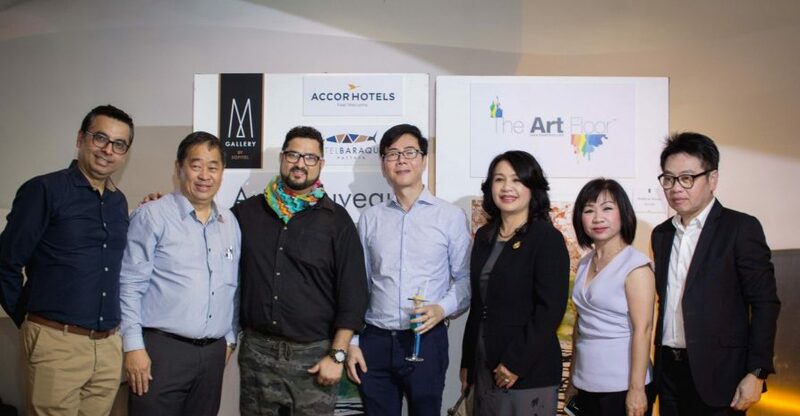 All in all, it was a fabulous evening to remember in Pattaya as we celebrated art, culture, raised awareness on Ocean pollution and officially introduced the Baraquda Mask (Tears of Poseidon) in the hotel lobby along with Dash exclusive “The Art Clock” project. Using his mesmerizing free flowing style he almost inevitably creates masterpieces on canvas that weave magic and mostly tell “a story of evolution and life that thrives despite earthly travails”. Over the last half a decade he has developed a versatile painting style of his own. He is a people’s guy & fearlessly enjoys working in public, collaborating with them while using off beat art materials, wall paints, adhesives and tools from daily life, easily available anywhere which makes his live art platforms extremely spontaneous, fun & engaging at the same time. Most surprisingly he uses no traditional art tools like brushes and spatulas and prefers his hands to glide through paints and canvasses. His abilities to understand & engage with communities & assertive networking skills are his biggest Forte. 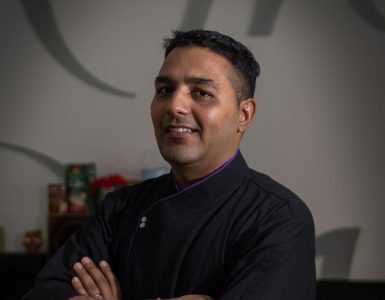 Dash works with some of the top artists and collectors in India, Most importantly aka Dash uses part proceeds from sales of his canvasses to support a host of development causes around his community. A curious explorer, he continuously experiments with life, with a welcome spirit he enjoys entertaining, fathoms cooking and believes that “the way to a Man’s heart is through his stomach” & “the way to success is through (helping ) others”. The nature in all its glory and grandeur has always been an inspiration for the artist. Through these sublime and thought-provoking set of works the artist is trying to establish the importance of preserving our precious environment. In his abstract vocabulary he has subtly narrated the gravity of earth’s current situation. The alluring visuals and vivid colours confront us with the beauty in nature amidst a grander cautionary narrative of conserving our fragile ecosystem for the well-being of mankind.